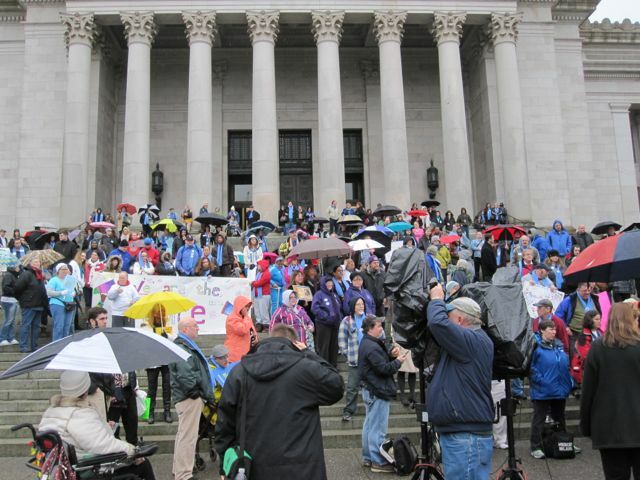 The WEECARE Coalition is inviting individuals, families and providers from across the state to come to Olympia and let legislators know how important early intervention services are to infants and toddlers with developmental disabilities and delays. The day begins with a briefing by The Arc of Washington and will focus on issues that are important to families who have sons/daughters with developmental disabilities and delays. We will meet at the General Administration Building at 10:00 am. We are organizing a rally in the South Portico of the Legislative Building at noon and are inviting speakers to address early intervention issues this session. Please plan to attend. We encourage people coming on this day to try to make appointments with their legislators. February 17th is an important bill cutoff day so Legislators will most likely be on the House and Senate Floor all day. If you cannot get an appointment, please ask the legislative aide if it is possible to “pull them off the floor” for a few minutes to speak with them. While there are people who care about early intervention services in Olympia, The WEECARE Coalition has also reserved a room at 2:30 to have a conversation about what is working well and what might be better with our early intervention system and services. This will give us input on possible legislative issues that we might want to advocate for in the future. Click here for more information on Advocacy Day including a map of the Capitol Campus. Click here for information on Early Intervention Services.